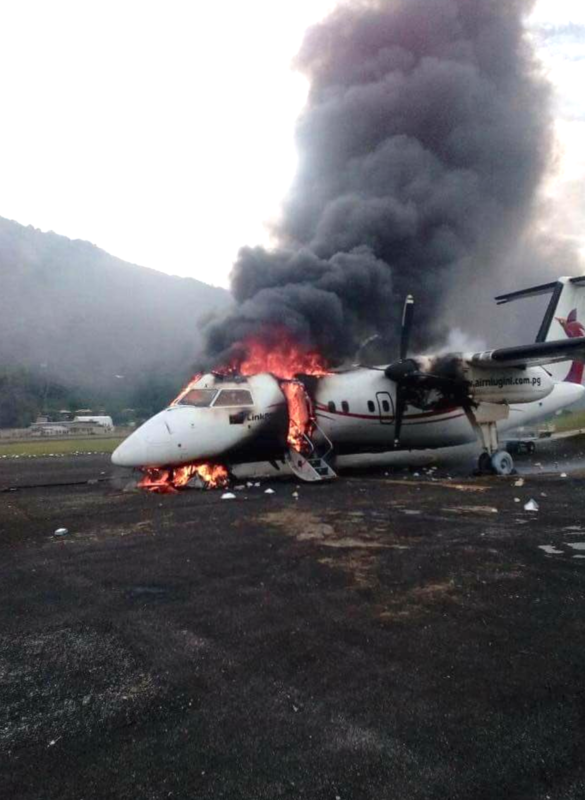 AYMN/Mendi has been closed indefinitely after protesters set fire to and destroyed an Air Niugini Dash 8 aircraft, which had just arrived from Port Moresby. The protest was in response to a court ruling confirming the election of the Southern Highlands governor William Powi. “(Initially) the local police station commander Gideon Kauke had said police were guarding the aircraft to ensure there was no further damage, after its tyres had been flattened. The Australian Department of Foreign Affairs is cautioning all to “reconsider your need to travel” to the regions affected by the unrest and to also “exercise a general degree of caution” for the whole of PNG. The local NOTAM says it all. Additional reporting indicates that the aircraft was shot at on landing, deflating the tyres. Are you currently in PNG and can fill us in on more? Please comment below, or email us.